T-Mobile’s support pages spilled the beans on the HTC U11 Life a bit early, but today the news was made officially official: the U11 Life is coming to T-Mobile. The HTC U11 Life will be available exclusively from T-Mobile starting tomorrow, November 3rd. Pricing will be set at $12 down and $12 per month for 24 months, which works out to a total price of $300. HTC’s new smartphone features a 5.2-inch 1920×1080 Super LCD screen on its face along with a fingerprint reader below it and a 16-megapixel camera with f/2.0 aperture above it. Around back there’s a second 16-megapixel camera that includes phase detection autofocus, a pro mode with RAW support, and an f/2.0 aperture. Inside the HTC U11 Life’s IP67 water resistant shell is a Snapdragon 630 processor that’s paired with 3GB of RAM and 32GB of storage. There’s also a microSD card slot if you need additional storage. Powering the whole package is a 2600mAh battery, and to recharge that battery, the U11 Life has a USB Type-C port. The HTC U11 Life supports LTE bands B1/B2/B3/B4/B5/B7/B12/B17/B13/B28/B20/B66. It also includes 2CA and 3CA as well as VoLTE and Wi-Fi Calling. On the software side, the HTC U11 Life runs Android 7.1 below HTC’s custom Sense UI. One of the highlight features of the HTC U11 Life is Edge Sense, which debuted on the flagship U11 earlier this year. With Edge Sense, you can squeeze the sides of the U11 Life to perform actions, like launching your camera app and then taking a photo. It feels like it’s been awhile since we’ve seen an HTC phone on T-Mobile’s shelves, so it’s good to see the HTC U11 Life coming to T-Mo. It may not be a flagship-tier device, but having a devices available from a variety of manufacturers is a good thing, and now HTC hardware will be available from T-Mo once again. So this will be T-mobile’s second phone with Band 66 support? Band 66 is an extension of Band 4. Band 71 is the 600 mhz spectrum and this phone does not support it. 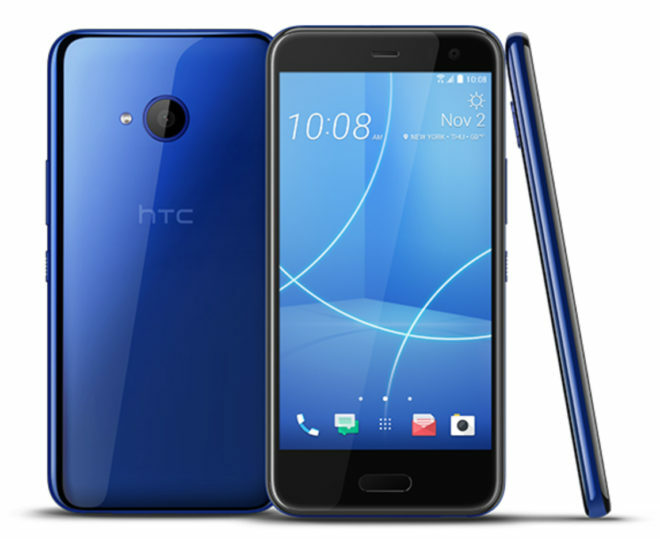 For the price it’s good deal, by the time we can fully utilize the 600 MHZ HTC U12 would be out by that time so I suggest getting usually HTC offer trade in offers for the older model. I wish they still kept the jack port I really don’t like carrying around adapters. Cross our fingers their cool accessories . Or just hook the adapter onto your earring, lol. Any chance for the U11+ coming to Tmobile? Nope. HTC even said the U11+ is not even coming to the USA at all At least for now. This is the typical Western Hemisphere sad story for all phone makers from Samsung on down… we don’t get the best models. At best we get the Plus lesser storage & ram version, if at all. So this or the X? He’s saying this phone or the iPhone X. They aren’t even comparable. Seems like a nice midrange phone at a reasonable price. Something T-Mobile definitely needs in it’s lineup. They have plenty of midrange phones already. but this is the first that’s water resistant, front fingerprint sensor and excellent camera. we welcome it in retail! Hopefully LG,ZTE,,will come out with midrange phone with 3 gigs of ram,like Lg Stlyo 4 plus,the next ZTE Max phone. TMo sales people won’t bother to show it to anyone. Why? They show off LG and Samsung’s midrange phones. Why not do the same for HTC? That’s a good question. They never showed me any of the M series phones. Of course, this could be a local thing. The consolation prize is not much of a consolation. The U11+ is what we want, the real Pixel 2 XL. It’s a budget phone. Nothing wrong with those. Pretty decent for a midrange phone. Cheaper than the Moto X4 and Zenfone 4 with practically the same specs. I wish T-Mobile would carry more phones from Motorola besides the Z2 Force. It would be nice if they had the Moto X4 and the Moto G line, but those are only sold unlocked. Verizon has a few Zenfones from Asus, so I’d like T-Mobile to carry those as well. T-Mobile needs more phones from a variety of manufacturers. I was in a Verizon store the other day and they sold phones from Moto, Asus, and other brands that aren’t Samsung, Apple, or LG.